'"Papa, help!" he cried. "A waterfall's coming out of my bottom!"' 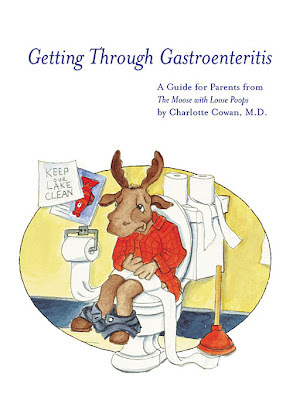 - The Moose with Loose Poops by Charlotte Cowan, M.D. Diarrhea can cause distress, especially in young children. It causes parents to worry, too. I should know. A couple weeks back my daughter caught an intestinal virus and suffered for two weeks straight. The poor girl lost weight, visited the doctor and missed several days of preschool. She dealt with it in her own way, by making up a song with the refrain, "DiarrhEEEEEEEEEEEEa, DiarrhEEEEEEEEEEEEa! Oh, oh, oh, DiarrhEEEEEEEEEEEEa!" (While she didn't enjoy the illness at all, she liked saying the funny, new word repeatedly in a loud voice.) Her sickness made us all miserable because it interrupted our lives, schedule and meal plans. 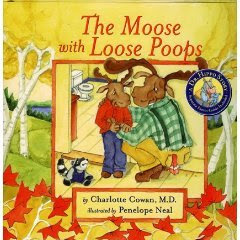 The Moose with Loose Poops picture book by Charlotte Cowan, M.D. discusses the subject of gastroenteritis with humor and kid appeal. A little moose named Miles goes on a picnic with his family and suddenly becomes ill. He throws up and his parents take him home and put him to bed. The next day he suffers from a bout of diarrhea (loose poops) he describes as a "waterfall" coming out of his bottom. As a result of his illness he must postpone a camping trip with his father. His parents show great care and concern for their little moose, and even Miles' sister reassures him that everyone experiences stomach ailments at some point and that he will get better. Mom calls Dr. Hippo and he recommends lots of fluids and no school. Miles recovers after a few days, just in time to go on a special camping trip with his dad. The book certainly struck a chord with my daughter. She sat and listened to the entire book with great interest and commiserated with Miles, the diarrhea-stricken moose. The Moose with Loose Poops helped her realize that she would get better eventually with proper care and encouraged her to keep drinking fluids. She also learned a new handwashing song she can sing to the tune of Twinkle, Twinkle Little Star from reading the book. And, of course, she loved the colorful watercolor illustrations by Penelope Neal of the cute moose family. The unusual title of Cowan's book has garnered some attention. One blogger went as far as calling it the "most disgusting book title ever." Cowan doesn't leave much to the imagination in her title or in the book itself. The main character in the book vomits chunks of hot dog and is depicted sitting on the potty, though he is covered discreetly with toilet paper. But, everything shown is true to life. Nearly all kids I know have encountered some type of virus causing these problems and they can't help but discuss their toilet time. I applaud the author for writing a book that portrays gastroenteritis in an honest, educational and imaginative way children can understand. A separate, laminated parent guide called "Getting Through Gastroenteritis" is included in the back of the book and offers helpful tips for parents on how to cope with gastroenteritis. Dr. Charlotte Cowan is a board-certified pediatician, a mother, and the author of the Dr. Hippo Series of books published by the Hippocratic Press. The other books in the Dr. Hippo Series for children ages 2-7 include: The Little Elephant with the Big Earache , Katie Caught a Cold , Peeper Has a Fever and Sadie's Sore Throat . Update 3/1/09 - To help celebrate Book Giveaway Carnival Week, author Dr. Charlotte Cowan has kindly offered to sponsor a giveaway! To enter, visit Dr. Hippo and leave a comment here telling me which Dr. Hippo book is your favorite. Ok, I literally laughed out loud when I saw this! Oh, kids books! It's funny, but kids actually LOVE these books that I find really gross & quite hilarious!--maybe I just have a weird sense of humor lol. But, I mean... "The Moose with Loose Poops"...just, ouch! I understand the purpose of the book, but I'm not sure I would be able to get through it without laughing! Maybe I'm a little immature? My 10 year old sister would Love that book! My nieces would love this book, they get thier sense of humor from their dad!!! I feel your pain, I had this same stomach virus around Christmas and was sick for 2 1/2 weeks it was horrible!!! Hope she is feeling better now!!! Love books that show normal things with the body. My favorite book from Dr. Hippo is Pepper has a Fever. Thanks for the opportunity. Thanks so much for making my family think I am wierd by laughing out loud. LOL ........ awesome book, I really hope to win. My 4 year old would love this. He talks about diareah (correctly) all of the time! Sadie's Sore Throat looks cute too. I would like to see one about growing pains because my son always complains of sore knees. My favorite is "Peeper Has a Fever"! I never knew these kind of educational books for kids existed! What a fun way to learn! I like Sadie has a sore throat. I like Sadie has a Sore Throat! What a great title! Peeper has a fever looks like fun too! Sadie Has A Sore Throat is cute! Katie Caught a Cold is just to perfect for this winter season. I think my daughter would also enjoy Katie Caught a Cold and Sadie's Sore Throat, as these often happen to her during winter cold season here in Maine. my 2 year old would love these. Katie caught a cold sounds good! Since it is cold season, I think Katie Caught a Cold would be good. My grandchildren would love this book!! Thanks...great sweeps! Hilarious - and helpful. My grandsons need this RIGHT NOW!! I'd like Katie Caught a Cold for my kindergarten kids! Katie Caught a cold looks like it would be really cute. I think Katie Caught a Cold would be appropriate this time of year. My little grandson would love any of the books, though. Thanks for the giveaway. Please enter me. Peeper Has a Fever looks good too. My son would enjoy reading these I'm sure. Sadie's Sore Throat sounds like a great book, too! I'd love this for my girls! Sadie has a Sore throat looks cute..they all do especailly this Moose one!! LOL...Please enter me...and I just clicked to follow you!! My preschool class would just love this. Sadie's sore throat looks good too. This would be a great gift for my nephew! Thank you for offering this giveaway! eyeslikesugar [at] gmail [dot] com. Katie Caught a Cold, these books are brilliant! Katie has a cold looks great. I love that someone has written about common health issues with kids and in such an accessible and non-scary way! I would love to read Peeper has a fever. I do have to say that the title of Moose caught my eye and made me chuckle!! I'm a follower and an email subscriber! I am a E-mail subscriber!!!! Never heard of this book! I also like the Katie Caught a Cold book. Honestly, The Moose with Loose Poops seems to be my favorite. Can't go wrong with a book about poop. Both my sons and I loved Little Elephant with Big Earache...the illustrations were the best! We actually own that one and I'd love to win this one. Thanks for the giveaway! I have never read one of these books before so I do not know which would be my favorite. I think all of these would be a wonderful addition to my books. Great book! My son loved it! We read it together and I think he really learned about his sickness! He's 6 and learning to read in school right now so hopefully he goes and tells his teacher he helped me read it!! I haven't read any other of Charlotte Cowan's books, but I know they're out there, and I'm sure they're just as good. Keep doing what you do best! This really does help! Thank you! I've never read them but Katy caught a Cold looks like a helpful one. This sounds like a great book! The kids would love it! thanks! The little elephant with the the big earache sounds great. I know the book context could be offensive, but as a director of a preschool, this type of book is strongly encouraged. It talks about toileting and also what it means to be sick and ways that it could be prevented (washing hands). Please enter me. We would utilize this book at the school. "peeper has a fever" So cute! Katy caught a Cold looks good. My kids would love "The Moose with Loose Poops" (and so would the hubby, I'm sure)! I think "The Little Elephant with the Big Earache" or "Sadie's Sore Throat" would be good too. Please include me in your drawing. My grandson will love it. I like Katie caught a cold. Peeper has a fever looks cute. But The Moose with Loose Poops would have to be my favorite. Too funny. I like Katie Caught a Cold. Sounds cute. PS... I love your blog, your reviews and your incentives! Great way to keep us coming back! The Little Elephant with the Big Earache. My daughter gets ear infections quite often so this would be great! I'd pick "Katie Caught a Cold" because ALL kids get colds so it's very useful!! Katie caught a cold would be really great for my kids. Peeper Has A Fever looks really great. This looks like a really fun giveaway. Thanks. My favorite book is "The Moose with Loose Poops". My niece would love this book. She's really into potty humor right now. Sadie's sore throat sounds like a good one too. Just wanted to say thanks for the review. This is the first I've heard of the book and I'm sure it will help children experiencing this for the first time. These are such adorable books! I soooo love "Sadie’s Sore Throat." I'm a subscriber to your AMAZING BLOG via e~mail. I follow you and just tweeted the contest (@NestingKara). 'Katie Caught a Cold' looks cute.